The “Line Items” panel on the Work Order page is used to add new products and services to the Work Order in progress. Line items are products and services rendered that the customer will be required to pay. Click the “Add Line Item” button. After clicking the button a modal will appear which provides options for adding a new line item. Add an item description, quantity, and unit price for the line item being added to the Work Order. Helpful Hint: These items will be shown to the customer on the estimates and invoices. Be sure to describe the service or product accurately. Next we use choose the option that determines if the new line item being add is a “product” or a “service”. Choose one or the other. Helpful Hint: Products are anything that would come from a parts store such as a timing belt, an oil filter, a new starter. A service is anything that you would bill to the customer that represent a labor charge. Next we choose if the item is taxable. Taxable items will have a tax markup applied to the Work Order. Non taxable items will not receive a tax markup. Using this feature is a big time saver! 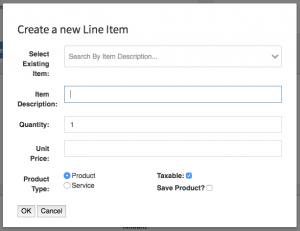 It allows you to use the “Select Existing Item” field to quickly add this line item to future Work orders without having to re-type the line item repeatedly. When the form is completely filled out click the “OK” button to save the new line item to the Work Order. 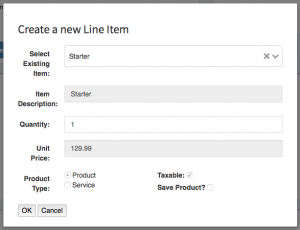 After clicking the button a modal will appear which provides options for adding an existing line item. To add an existing line item to the work order you will only be interested in two fields. The first one is the “Select Existing Item” field. To use the field, start typing a word that represents the line item that you are looking for. The field will then recommend some options that match the words entered into the field. Choose a recommended value that best matches your search. Upon selection the selected item will auto populate all values in the form on your behalf. Helpful Hint: You’ll notice when the form is auto filled out by the existing line item that the fields are not editable after that. This is by design. The last step is to choose a “Quantity” for the selected line item. How many of these did you just sell? How to delete a line item. Click the delete button located next to the line item you attempting to delete. Don’t forget to save the Work Order after modifying line items. Clicking the “Update Work Order” button after modifying any line items on a work order will save your changes. Failure to save your changes could cause you to loose your work if you happen to leave the active work order page. After clicking the “Update Work Order” button this will save your changes and update the totals owed in the “Payments” panel and within the “Line Items” panel. This applies any markup specified for products and any eligible taxes for a line item.